Refreshed from my train journey from Lanzhou I was ready to begin my Lhasa city tour. Being part of a group wasn't something I was used to but for that experience it was good to be forced into an unfamiliar situation. From Drepung Monastery to Sera Monastery I was shown a myriad of beautiful and timeless sights, although being above sea level was crazy! Was it a dream?! Was it the effects of altitude or have I already mentioned about my first moments in Lhasa's old city before? That's tough because before my official tour began I conducted my own tour during my first afternoon in Lhasa. Captured to the right is Beijing East Road, I loved the traditional style of the buildings as the street buzzed with the Tibetans everyday motions, city life existed in the city's oldest quarters! It was a blessing not to have to change any currency because everything was sold in Chinese Yuan, the less I mention the C would the better in this blog. A language I hadn't heard before was being chattered all around me, that was the Tibetan language that along with the Sanskrit writing had its own tone and energy. I loved Lhasa, well the old city had something the new side couldn't compete with, that was character. Passing the Potala Palace on the corner I was curious to see it before the group all saw it together. My hotel was standard to be honest, I opted to share a room because I wasn't prepared to pay the single room supplements and I wasn't there for the room for it was all about Tibet! Staying at the Gang-gyan Hotel just off Beijing East Road I was able to walk to Potala Square within fifteen minutes. Standing before was the mighty yet very serene Potala Palace, the centre of Buddhism and a world renowned Tibetan icon that relates to the same as the Vatican does for Roman Catholics. The serene blue skies quickly clouded over, it wasn't meant to be for getting photos during that moment but I appreciated that time all the same. Aside from the sights I was part of a group of fourteen people who had come from around the world to visit Lhasa, mostly based in Mainland China people in the group hailed from Brazil, Ireland, Spain, U.S.A and Germany. Straight after the Lhasa tour the remaining thirteen people and the tour guide were heading to Shigatse then to the Everest Base Camp. Go T! Standing 3,700 ft above sea level it did feel strange to ascend any higher than that but Lhasa's Drepung Monastery wasn't going to move its hilly location for yours truly! My first holy site during my once in a lifetime tour looked mighty fine, perched upon one of the thousand mountains that can be seen around Lhasa I gazed in amazement as the white washed stone walls stood so bright in the crystal clear sky, the detail of that 14th century sacred monastery was unbelievable! With snatched photo opportunities I made the best to capture as many moments to seize Drepung's mystical look for myself. Going inside the many rooms and shrines showed me things that I never previously seen before. Following the rules it was forbidden to take any photos inside the many accessible buildings within the Drepung Monastery, obviously I followed that rule along with the people in my tour group. T, I was living a dream! How, the sheer detail of the shrines and figures within the Ganden Phodrang blew me away, taking careful notice of our tour guides direction it was easy to get carried away for the items on show were nothing like I'd ever seen in a temple-like place before. Prayer scrolls had been crafted with much thought and were displayed within a wooden cabinet, the religious text had been wrapped in a undeniable beautiful cloth to protect them. We were being schooled from then on about the dear Dalai's as they would be a recurring feature in the tours programme. The musky smell of incense filled the air, along with the dimmed redden light it was truly immense to see the golden items and figures that were on display. If I could of taken photos it would of not captured the true beauty of realness of what was before my eyes. Leaving the warren-like rooms behind us we spent some time exploring inside the main hall that welcomed the prayer of the monks who lived at Drepung. Oh, definitely a wow! From Drepung Monastery it was a short drive to Sera Monastery, before seeing the monks debate it was time for a light lunch. It was a chance for some of the group to get to know each other, being an independent traveller most of the time it was nice to have people to talk to from different places but for that trip only. As 3 pm neared it was time to see the monks debate at Sera Monastery, another of the three most important holy sites in Lhasa. For some strange reason cameras were banned for photos but smartphones were allowed to take photos, such a bizarre rule. Perching in front of the questioning monks it was such a intriguing sight, younger and less experienced monks answered questions asked by the older monks, if their answer wasn't correct they would literally get a clap back! The debate was quite interesting to see, the main language wasn't Mandarin but it was spoken in a Tibetan language! The experience of seeing the monks debate at Sera Monastery was amazing, it was something that I had never seen before, another once in a lifetime sight in Tibet for me to remember forever. Children seemed to be the main focus of the local people's visits to Sera Monastery as they would queue from morning till closing time to get a blessing for their children, children must still be highly prized in Tibet as well as they are in China? 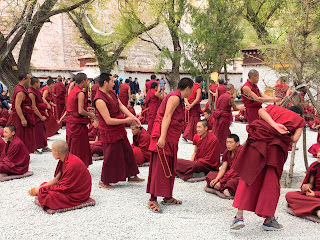 The visits to Drepung and Sera Monasteries were out of this world, from the timeless collections and relics that were on display at Drepung to the insightful debate at Sera, it was giving me life for sure! Returning back to the hotel for a little rest it was nice to put my feet up and re-hydrate as the high altitudes and thin air had made me feel thirsty and tired. The evening ahead would bring us a welcome dinner including a questionable series of Tibetan acts, the food was good but it was amazing to rest before the next day of sightseeing. Rest Joe! Lhasa, Tibet: Heaven On Earth!